So you may or may not have noticed that I added a new little section to the blog towards the end of last year. If you view the site on a desktop computer, it’s easier to find (top left). If you view it on mobile it’s more difficult, but I’m working on fixing that. It’s a new lifestyle section. It’s what I’ve been calling my section. It’ll ebb and grow with time, but for now it’s my place to share all the other things I’d like to share. Life beyond the baking, so to speak. So if you’ve ever enjoyed reading my Stitch Fix posts, or getting the newest update in our journey to try and start a family, or want to follow any other shenanigans, that is now where you will find those things. In fact, the most recent update on our [in]fertility journey went up yesterday, so be sure to check it out if you’re into that sort of thing. 🙂 You can even sign up to get emails for those new posts now. 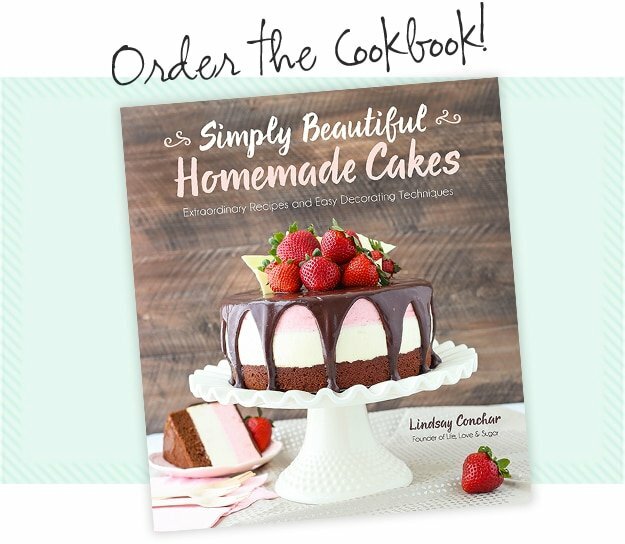 And if all you want are the cakes and recipes, then you are already in the right place! This cake today is two cakes in one – cake and cheesecake. Does it get any better than that?! When I decided to make this cheesecake cake, I looked back to see what other cheesecake cakes I had on the blog and to my dismay, I found only ONE! There’s even two of them in my cookbook! How are there not more on the blog?! Well today we fix that, my friends. Starting with this fabulous combination of strawberries and cream. This cake really isn’t hard to make, but it does take some time because of the two different cake elements. I usually make my cheesecake layer first and let it set overnight. Then the next day I bake the cakes and put everything together. You could do it all in one day, but waiting for the cheesecake to set can take a bit. One thing you want to be sure of when making the three layers is that they are all the same size. If you have a springform pan that doesn’t leak (they are hard to come by for me), then bake all the layers in that. If not, or if you just would prefer a regular cake pan, you can also use 9 inch cake pans. I did that this time around and it was a breeze. To set the pan up for the cheesecake, I just pressed aluminum foil into the bottom of the cake pan and had it sticking up over the sides of the pan. I used the foil to lift the cheesecake out of the pan once it was cool and firm. Easy peasy and the perfect size to make the cake layers. To frost the cake, I used a cream cheese whipped cream. Because the cake is fairly heavy with the cheesecake layer in the center, I decided to go lighter on the frosting. The whipped cream is super light and has a subtle cream cheese flavor to it. It’s nice and stable, so no worries about it “melting”. It can soften when it sits out though, so when applying it to the cake, don’t let it sit out for an extended period of time or it’ll be a little harder to work with. Because the frosting is a whipped cream and therefore is softer than my normal frostings, I wasn’t able to use my typical paper towel method of smoothing a cake. I used my offset spatula to apply the cream to the sides of the cake and smoothed it with my icing smoother. I finished the cake off with some fresh slices of strawberries. 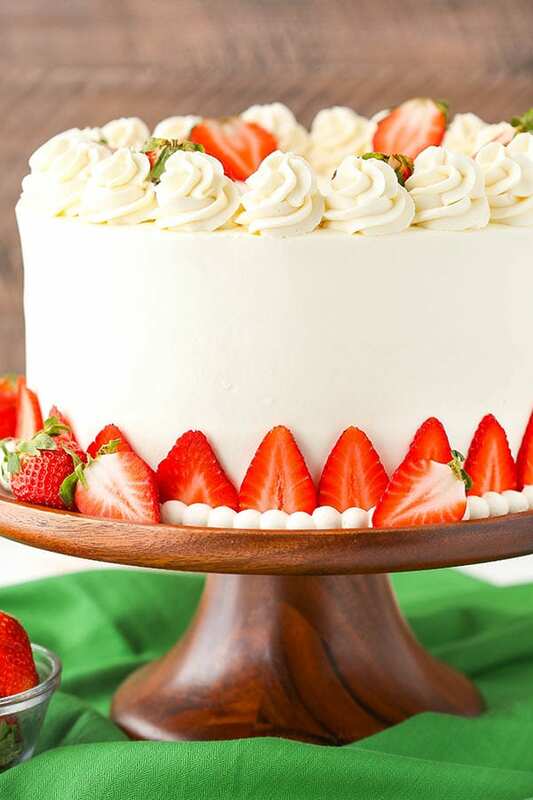 If you are going to be serving the cake at a later time after putting it together, you may want to add the strawberries shortly before serving so they don’t dry out. This cake was a HUGE hit! Not only did the hubs and I love it, my mom was dying over it. My nieces also came over and dug right in. We were all big fans and found it hard to resist! The strawberry cake paired with the creamy vanilla cheesecake and cream cheese whipped cream was delicious! I hope you enjoy it as much as we did! 1. Preheat oven to 300°F (148°C). Line the entire inside of a 9-inch (23cm) cake pan with aluminum foil. Press it into the pan to get it as flat as you can. You’ll use the aluminum foil to lift the cheesecake out of the pan when it’s baked and cooled. 3. Add the sour cream, and vanilla extract and mix on low speed until well combined. 10. To make the cake layers, preheat the oven to 350°F (176°C). Line the bottoms of two 9-inch (23cm) cake pans with parchment paper and grease the sides. 11. In a large mixer bowl, cream the butter and sugar together on medium speed until light in color and fluffy, about 3-4 minutes. 12. Add the sour cream and strawberry extract and mix until combined. 13. Add the egg whites in two batches, mixing until well combined after each addition. Scrape down the sides of the bowl as needed to make sure everything is combined. 14. Combine the flour, baking powder and salt in a medium bowl. Combine the milk and strawberry puree in a measuring cup. 15. Add half of the flour mixture to the batter and mix until combined. 16. Add the milk mixture to the batter and mix until combined. 17. Add the remaining flour mixture and mix until smooth. Scrape down the sides of the bowl as needed to ensure everything is being combined. Stir in the food coloring. 18. Divide the batter evenly between the prepared cake pans. 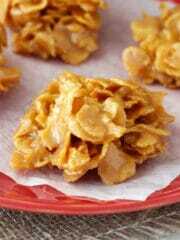 Bake for 27-30 minutes, or until a toothpick inserted in the middle comes out with a few crumbs. 19. Remove the cakes from the oven and allow to cool for 2-3 minutes, then remove from pans to a cooling rack to finish cooling. 20. To build the cake, make the frosting. Add the cream cheese to a large mixer bowl and beat until smooth, then set aside. 21. Add the heavy whipping cream, powdered sugar and vanilla extract to another bowl and whip until soft peaks form. 22. Add the cream cheese to the whipped cream and whip until stiff peaks form. It will happen fairly quickly. Set whipped frosting in the refrigerator. 23. Use a large serrated knife to remove the domes from the top of the cakes. 24. Place the first layer of cake on a serving plate or a cardboard cake round. Spread about 1 cup of frosting evenly on top of the cake layer. 25. Use the aluminum foil to lift the cheesecake out of the cake pan, remove the foil and place the cheesecake on top of the cake. 26. Spread another cup of frosting evenly on top of the cheesecake, then add the second layer of cake on top. If the sides of the cake don’t line up, use a serrated knife to trim off the excess cake or cheesecake. 27. Frost the outside of the cake. 28. Pipe swirls of the whipped frosting around the top edge of the cake. I used the Ateco 844 icing tip. 29. 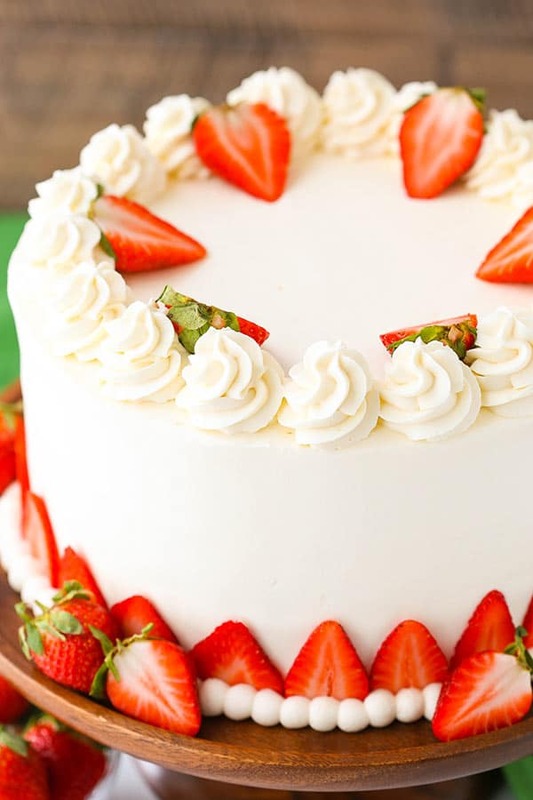 Place sliced strawberries around the bottom edge of the cake. Place strawberry halves on top of the cake around the inside of the swirls. 30. Pip a small shell border around the bottom edge of the cake. 31. Store the cake (in an airtight containter, if possible) in the refrigerator until ready to serve. Cake is best for 2-3 days. Ohhhh I am DEFINITELY a true cake lover – and I love the way this looks! Perfect layers, and I always appreciate the videos as I’m a complete noob when it comes to baking. It’s my birthday in less than two weeks, and I’ve been thinking about baking a cheesecake-cake! Oh my word, this cake is truly spectacular. 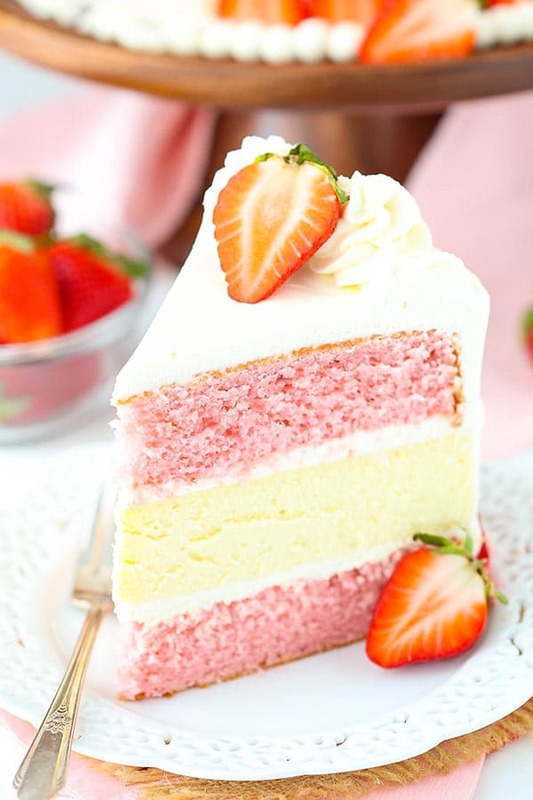 I love anything strawberry + cheesecake so this is definitely my dream cake. 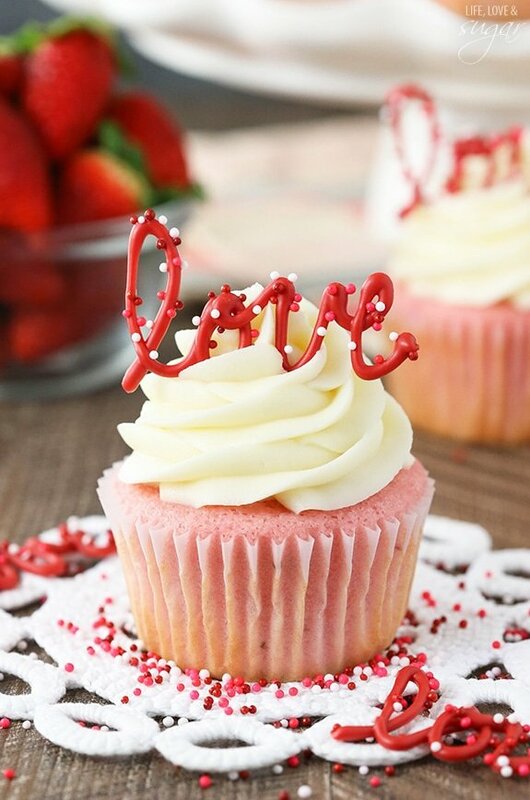 So pretty and perfect for Valentine’s day, or any day for that matter. Thank you for this epic recipe! This looks yummy. what tip did you use for the bottom border please? This cake is amazing! I love cheesecakes of any kind but I’ve never tried a cake AND a cheesecake in one 🙂 I’ve just put the cheesecake in the oven and later on I’ll be doing the cake layers. I hope everything will turn out great 🙂 Can I use frozen strawberries for the puree? I hope you enjoy it! Frozen strawberries would be fine and would bake ok. Just keep in mind that they should be thawed and patted dry before pureeing them. If they have extra water, it’ll water down the flavor of the strawberry in the cake. The better the strawberries, the better the strawberry flavor. Hi Lindsay. I am making this cake in the morning for my daughters baby shower which is on sunday. I was not able find any fresh strawberries so i am opting for frozen. I am making a two tired cake. Two 9 in cakes with the cheesecake center, and then two 6 in strawberry cakes on top. I have found another recipe for the icing, a decorator cream cheese icing, because I want to use the “rose swirl” technique on the bottom layers and i know the whipped cream frosting wont hold up for what i want to do. Are there any suggestions you might have for my idea ? I only have one 6 in cake pan so I will have to make the batter and then make one cake wait for it to cool then make the other. Being as the recipe calls for only egg whites do you think this will be a problem ? Thanks for any ideas you may have. I am wondering how the puree between layers was for you? I am not too keen on extract. How was the strawberry flavor? Also did it make the cake layers too wet? What strawberry puree recipe do you use? Just puree your strawberries in a food processor or blender? Or do you use a recipe that calls for sugar? Thanks. I just puree the strawberries right in the food processor – no added sugar. That is one amazing looking cake! I am going to try this for our next special occasion! Your photos are amazing too! What tip do you use for your swirls on the top? Hi, I need a gluten free recipe for the strawbeŕry cake. Do you have any suggestions? Thank you. I haven’t experimented much with gluten free. Would a gluten free flour work or are there other ingredients that need to change? 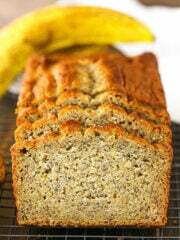 I plan to make this recipe gluten free by using Bob’s red mill gluten free 1 to 1 baking flour in place of the all purpose flour. I have made several cake from this blog by doing that and they have all turned out great! Just double check that all your other ingredients are g-free. Oh my God! 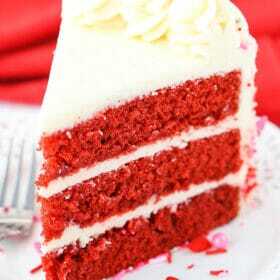 wish i can have a slice right now. Do you think it’ll be suited for a sugar past coating? It’s a relatively heavy cake and should hold up ok. This cake looks to die for!!! I can’t wait to make it. I am having a hard time finding strawberry extract where I live in Canada. Could I just replace it with strawberry jam in the same amount to get a good strawberry flavor? I haven’t tried it with jam. I don’t think the flavor would be as strong, but it’d be worth a try. I usually use strawberry powder jello for it. May work? Then u don’t need food coloring added either. Not sure how it’d affect this cake. You could try it. Hi, Watkins is available in Canada they carry a strawberry extract. Also Lorann’s is available through most online shops and they have a strawberry emulsion. I purchased a strawberry flavor, Looks just like extract but say’s it is stronger ,at Micheal’s in Nova Scotia Canada . I’m sure you will know the store 🙂 I haven’t tried it yet but I’m about too. I will be making this cake next week! I have made several of your cakes so far and they have all been fantastic! I just ordered the strawberry extract so it will arrive in time! This cake was very good, and quite impressive! But, I am wondering if you have any ideas on why my strawberry cake was so dense? I’m not sure what I did wrong, since it seems like the cake should have been lighter. Typically I see that happen when the butter and sugar aren’t fully creamed. Other than that, it’d be hard to say without seeing it. There is a video just above the pink box with the recipe. It should the decorating of the cake. Just wondering how Long it takes to make? I’m not sure exactly. I did it over a couple of days. The cheesecake has some prep time involved and has a total baking and cooling time of about 2 hours, plus cooling in the fridge. When you add the cake layers and putting it all together, it’s quite a bit of time. I used a cake pan and it turned out great. It was a regular 9×2 inch cake pan. 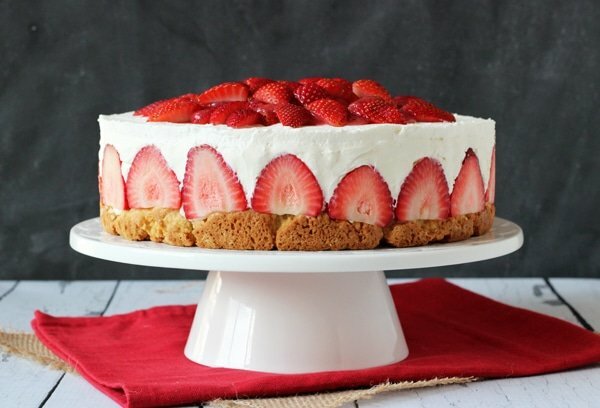 I am going to be making the Strawberry Cheesecake Cake tomorrow for a friends birthday. My question is when baking the cheesecake does it have to be cooked inside of another pan, is that a must? And what is the purpose of putting the pan inside another pan while baking? Baking the cheesecake in a water bath is very recommended. Without it, the cheesecake will brown around the edges, likely fall in the center while it cools, and most likely crack. If those things don’t bother you and you don’t mind filling in the center/cracks of the cheesecake with frosting or something when you stack the cake, then you could bake it without the water bath. If you do that, you’ll probably need to knock 15-20 minutes off the baking time for the cheesecake. Good evening, I just want you to know that I made the cake and it turned out wonderfully and delicious. It was a big hit among my friends and family. I have received so many request from them for this cake. Thank you again for the wonderful recipe and sharing it with myself and the world. I am truly a fan and I can’t wait to try many more of your recipe’s. This looks amazing! I love the idea of the whipped cream cream cheese frosting. Could you tell me how much (either by volume or weight) frosting it makes? Thanks! Omg this cake look gorgeous! My 63rd birthday is the 18th of this month and I want this cake! It is just beautiful besides being luscious looking! Can’t wait to try this cake!! My daughter’s 21st birthday is coming up and strawberry is her favorite ???? Hey, i’m looking for a recipe for a cream cheese frosting that I could use for a completely smooth cake. I’ve been watching your tutorials and can’t wait to try. I know this recipe is a whipped cream frosting and you can’t use the paper towel smoothing method, but do you have a recipe for cream cheese frosting that could be smoothed with that method? Cream cheese frosting tends to be stickier so the paper towel method is always a little tricker. You can find my preferred cream cheese frosting here, but it is a bit sticky. 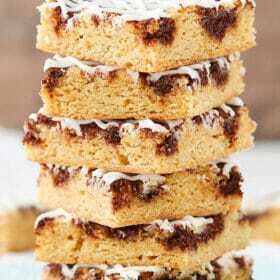 You could add more powdered sugar to offset it, but it changes up the texture and flavor a bit. Could you use a 9 inch springform pan? Would you still need the water bath? Yes, but keep in mind that your cakes could then be slightly different sizes. You’d still need the waterbath. It’s about the way the cheesecake bakes, not the pan. Without it, the cheesecake will be drier, fall in the center, brown around the edges and likely crack. Can’t wait to make this. Can I make the frosting a day ahead? That should be fine. Just refrigerate it. It’ll probably get a little firmer in the fridge so you might need to let it sit a minute before using. Made your cake. Loved the process, wonderful directions. I need some advice thou, I felt like my cake was too dense. What would make that happen? Do you sift the flour? The cheesecake was perfect. No cracks at all !!! The family and friends loved it. I just want to try it again with a better cake. Thanks again for the directions and for sharing. Often I find that happens when the butter and sugar aren’t fully creamed. Other than that, it’s hard to say without seeing it. My neighbor is turning 60 on Friday and I have been searching for the perfect cake to make for such a wonderful friend, well let’s just say one look at this beauty and I knew it was the one. Thanks for sharing I know she is going to love it! Oh my! This cake was as delicious as it was gorgeous. I made this for a Valentine’s gift for my husband who is not much of a chocolate lover but absolutely loves strawberry cake and cheesecake equally. What an ingenious idea…fabulous! Even better, I made the cake in heart-shaped pans. If my husband could ask me to marry him again, he probably would’ve this past Valentine’s Day. Thank you for sharing this phenomenal cake. I’m so glad you enjoyed it! Love the heart shaped pan idea! 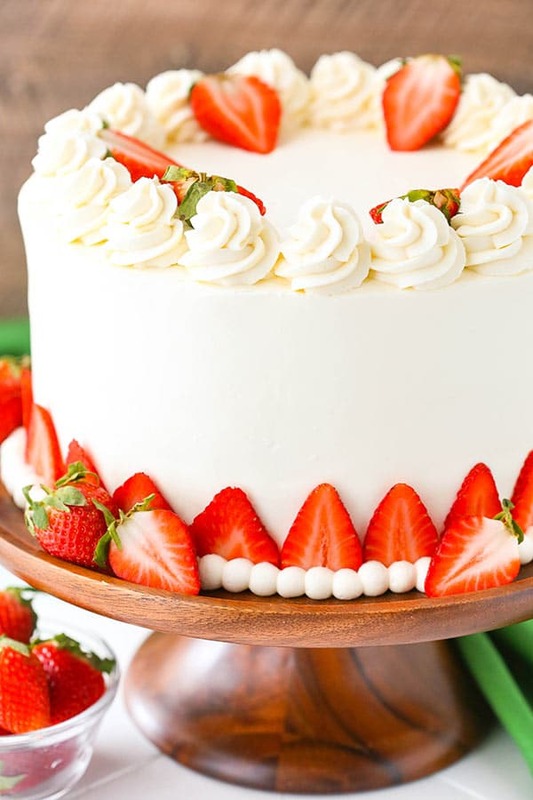 This cake looks great and I think I may make it for my daughter’s upcoming birthday since she loves strawberries and cheesecake. One question though…. Is there a substitute for strawberry extract? Is it really needed in the recipe? It’s not the easiest ingredient to find locally. Thanks for your response in advance! 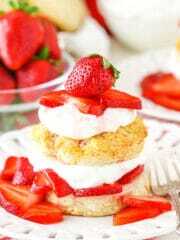 The extract provides most of the strawberry flavor in the cake, so it is necessary. 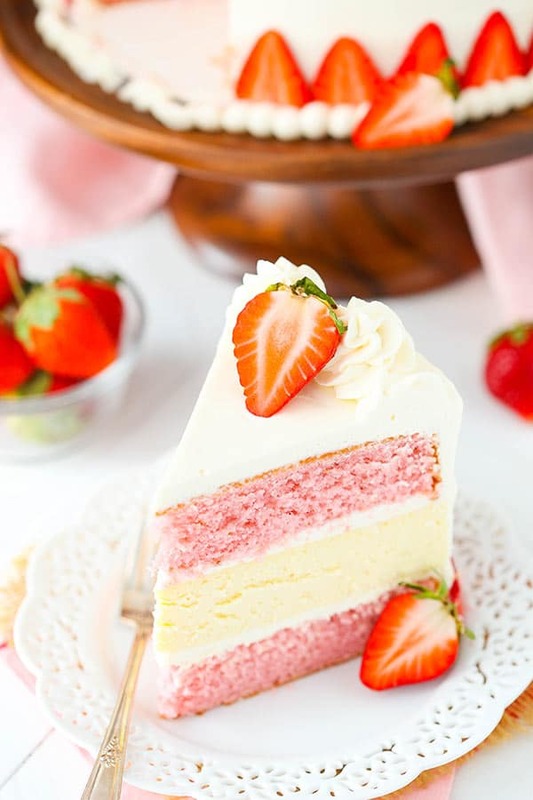 Alternatively, you could use this cake that gets it’s flavor from fresh strawberries. Follow recipe to a letter. Measure everything by the grams and all. The icing looked curdled and never reached stiff peaks after adding the room temp cream cheese that I had already whipped until smooth. What could have gone wrong? Heavy cream was also cold before whipping. HELP!! So this is only my second time making cheesecake and I accidentally spilled some of the water into the cheesecake… if I had to guess it’s about a half teaspoon of water. What should I do? Try to scoop it out and smooth it or just leave it? I might use a paper towel to soak it up a bit, but it will probably be ok.
Hi! This looks sooo good! I was just wondering, could you use a springform pan for the cheesecake layer, rather than a cake pan with foil inside? You could. I just like to use the same cake pan so I know everything is the same size. It makes it easier when layering and frosting the cake. I’m going to try making this cake tomorrow for a birthday party! What would you recommend when transporting this cake? It’s about a 45 minute drive, I don’t want it to fall apart! Will keeping it in the fridge overnight be enough for it to stay cool during the trip? It *should* be ok. It’s a pretty big cake and should hold in the chill well. I usually transport cakes in a large cake carrier. I’m so glad you enjoyed it! I hope you enjoyed the brownies too! 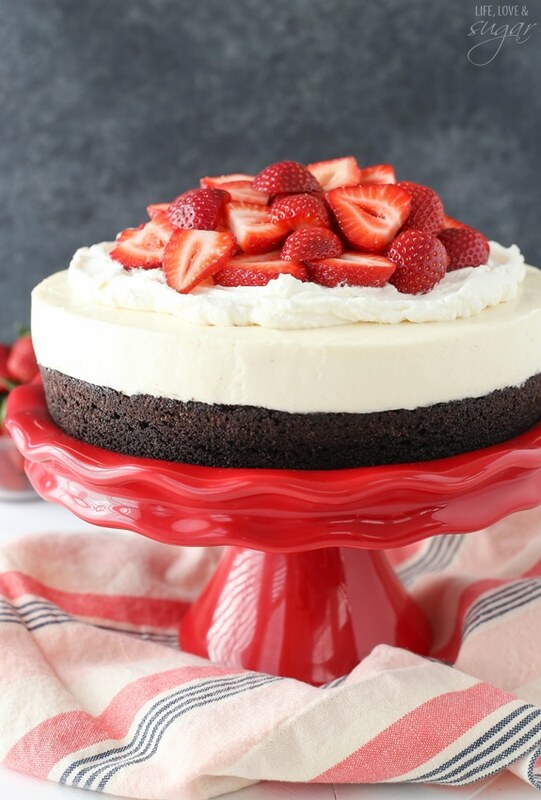 How do you remove the foil from the cheesecake after lifting it out of the pan and transfer the cheesecake layer onto the cake layer without tearing it up? I didn’t have any trouble. The cheesecake should be pretty firm. I just held it in my hands as I peeled the foil off. You can turn it over and it should be fine as long as you’re gentle. This cake looks great. I go to a Jewish deli that has a chocolate version of this cake. Although they cover it in ganash (sp). Why do you put frosting on top and bottom of the cheese cake layer? I would think it would increase the chance it would slide. I have never seen the heavy cream (whipping cream ) added to cream cheese. What inspired that mixture? Also do you think this whole cake would freeze well? 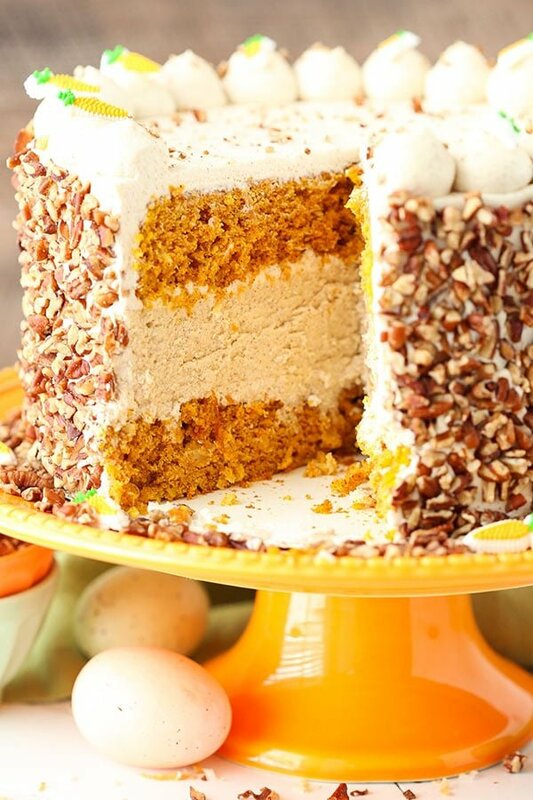 The frosting helps hold the layers together when you cut into the cake. It doesn’t slide around. The frosting is very light with the whipped cream added. Since it’s a heavy cake, it’s nice to have a lighter frosting. Four teaspoons is correct. I weighed 4 tsp just now and it was about 18g, so I can update that. Thanks. Can you color this frosting. I’ve been looking for a cream cheese frosting.. it looks like it covers flawlessly and pipes well. Does it? Do you change any part of the recipe to make it pipe like that? Also fx and plenty of baby dust to you! It should be fine with coloring added. I’d recommend gel icing color. It’s a whipped cream based frosting so be carefully not to deflate it by overtaxing. The frosting is made as written, I didn’t change anything. Would it be ok to use a whip cream stabilizer before mixing with cream cheese for a firmer icing? I was hoping to cover the whole outside of the cake with piped roses and didn’t know if it would hold up. Are you meaning traditional piped roses, or the piped rosettes like on this cake. It should hold up for the rosettes, but for traditional piped roses, you’re right that you’ll probably want something stiffer. Cream cheese does act as a bit of a stabilizer for whipped cream, but you could certainly add something else too if you’d like. I made this for my daughters birthday party. Cheesecake came out perfect, I just used strawberry cake mix for strawberry cake layers. Followed the frosting recipe exactly but when I applied to cake it became very runny. I made it the day before so it was refrigerated overnight and removed from fridge right before I frosted cake. Not sure what I did wrong! I used cold whipping cream but used my whisk attachment instead of beaters. The whipping cream formed stiff peaks but not as stiff as whipped cream I’ve made in the past. Cake and frosting tasting great but definitely did not look like your pics! Hmmm, did you use all the powdered sugar that’s listed? I know some people will reduce the sugar but it’s actually needed to keep the whipped cream frosting stable. Was reading thru your recipe and have a question – are the egg whites added directly to the batter or are they to be beaten and folded in? Looks beautiful. Will try soon. Thx and have a blessed day! I add them directly in a couple parts. 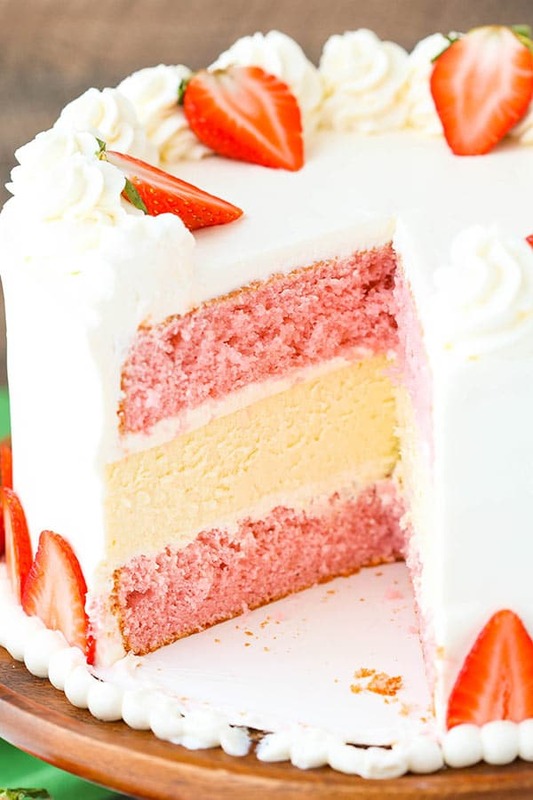 Instead of using 2 cake pans to create 2 layers, can I bake the cake in one pan and cut (using the cake layer slicer tool) it in half to create 2 layers? I only have one cake pan and wonder if I can do it this way. I wouldn’t recommend it. They are fairly thick layers and likely wouldn’t fit in the pan at the same time. Plus, I don’t think it’d bake as nicely. My aunt made this cake for me it was OUT IF THIS WORLD.. This cake was amazing and fairly easy to make split into two days. Thank you for the recipe! I would just use 150 and 180 and it should be fine. Those are the conversion numbers given online, since I use a fahrenheit oven. Thank you for your super fast reply. I made this cake yesterday and it’s absolutely delicious. Thank you so much again for this amazing recipe! <3 Like I said, I'm planning on making it again for my birthday in June! Help! My frosting didn’t stiffen. I followed the recipe to a T but my frosting is still kinda runny and nowhere near as stiff as yours looks in the video. It should naturally thicken. Did you add the full amount of powdered sugar? That is the thickener and stabilizer. HI! I just made this cake for my birthday and it did not turn out as expected. The cheesecake portion was excellent but the strawberry cake portion came out excessively thick and kind of tough. The cake was very dense. Is this how it was suppose to come out? And if not, is there any reason why you might think it came out like this? Thank you. No I wouldn’t expect it turn out that way. Should be pretty light and fluffy, in my opinion. I find that the most common issue is not fully creaming the butter and sugar, which adds air to that batter. If the cake kind of shrunk and became dense after pulling it out of the oven, that’s the most likely culprit that I know of. Hi! I made this for my daughters birthday and it was wonderful! 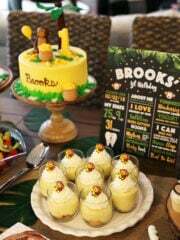 Now i want to make it for a baby shower. I was wondering if i could make the cakes and cheesecake ahead and freeze them and then thaw them and decorate when its time for the shower? 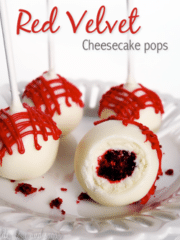 Have you ever tried freezes the cakes and cheesecake? I’m so glad you enjoyed it! I haven’t tried freezing it and it wouldn’t be as fresh, but I think it’d be ok. If i was going to halve the recipe and do it in a 6in pan, How long should I bake it? I haven’t ever made it in a 6 inch pan. Not sure. I made the cheesecake layer last night and baked it for 40 min, haven’t tried it yet but it looks right. This cake is amazing! Everyone that tried it loved it. My only problem was that my cheesecake cracked, but because I flipped it over (and it’s layered between two cakes) nobody knew. The only thing I did differently was I used a spring form pan for the cheesecake. Water baths make me nervous, so I didn’t want to put the cake in it, but I did fill a roasting pan with water and put it on the rack below the cheesecake (It’s been successful before). I’m sure I know where I went wrong that caused the crack, but since I’m being asked to make it again, I should be able to fix that error. Hi! Thanks for the great recipe! 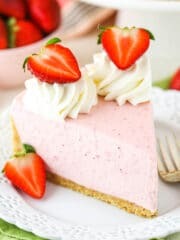 I just finished my cheesecake and tomorrow I’m making the cake layers but I couldn’t find strawberry extract I found instead McCormick strawberry flavor, do you think that one will work? And if it does, should I put 2 tbsp of that one too? That should be fine. I’d try using the same amount. your cake looks more than amazing. I am searching for ideas for by daughter’s bday cake and I think I found what I was looking for 🙂 the only question I have is : I hate buttercream frostings so I always use cream cheese one but it is never that stiff to frost the cake and decorate it. Now I see you use it with whipped cream so I believe (and see in your video) that it is pretty stiff. Do you think I can drip white chocolate garnache (coloured in pink) on the frosted cake? Will it hold it? million thanks for your advise!!!!! It might be ok. You’d want your ganache to not be too warm and your frosting to have set in the fridge for a bit, just to be careful. Loved this idea and all went well until took cakes out , hardly risen and seem quite dense. I have made a few cakes over the years so understand the need for creaming thoroughly which I did but cant understand why this has happened. The cake does seem to have a lot of liquid with sour cream , milk and puree cant understand what has gone wrong tried in normal and fan oven ? How deep are the cake layers supposed to be ? Hmm, it’d be hard for me to say what happened. The whole cake is quite tall. I’d say the cake layers are each around 1 1/2 to 2 inches in height. People had the same issue. Maybe the oven….? Awesome! I’m so glad to hear it was successful and you enjoyed it! Thanks Lauren! Hello Lindsay! This cake looks gorgeous and I’ll use it as inspiration for my little one’s 1st bday cake on Sunday! Can you tell me before Saturday if the egg white are added to the cake without first beating them? Thank you! The egg whites are not beat or whipped first. I hope you enjoy the cake! Awesome! Glad to hear it was a hit! I’ve made this twice in the last month for guests–they all felt it to be a very special treat! I ran out of strawberry extract and discovered all of the grocery stores around us have stopped carrying it (Hey, Dillons/Kroger & Target, what’s up with that?). So, of course the cake supply shop was out as well but they did have one bottle strawberry emulsion left. For a lemon raspberry cheesecake that I make, the recipe claims the emulsion gives a more real lemon flavor with no aftertaste that extracts can often leave–the flavoring is great in that so I thought why not? However, it’s much stronger so I just used a generous 2 teaspoons and it worked really well, plus added some red color. I thought I’d share in case anyone else ran into the issue I did. Thanks for a great recipe that really impresses! i have a question- could I substitute raspberry extract, puree and fruit and make a raspberry cheesecake cake? I would imagine that would be fine. Lindsey, I want to make a 5 layer cake with 2 layers of cheesecake. 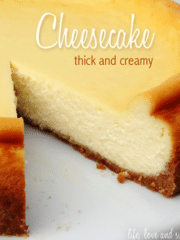 Can I split this cheesecake recipe into 2 pans or would I have to make double the recipe? Yea, you should be able to bake it in two layers. You’ll just want to reduce the baking time. im sorry, I have never baked a cheesecake. Can you estimate the time difference? Or can I bake into 1 pan and then slice in layers like a cake with a cake slicer? Beautiful cake!! 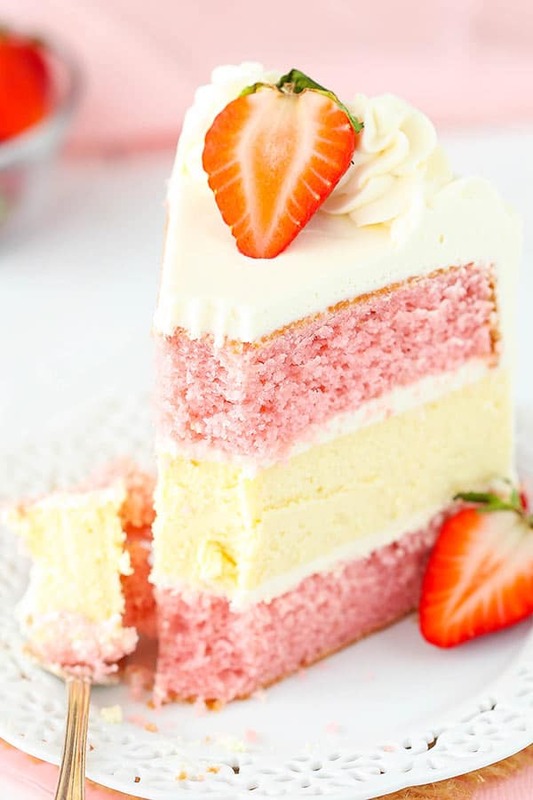 Would you suggest using this cake recipe for a strawberry layer cake (no cheesecake layer)? I’ve seen several others posted on your blog and I’m having a HARD time deciding which to try! Depends on what you are looking for in the flavor. This one has some strawberry extract in it, so the flavor isn’t as “natural”. This one uses all strawberries for the flavor. For the flavor to really come through you need strawberries that are very flavorful or it will be lacking. Thank you for such an awesome recipe!! 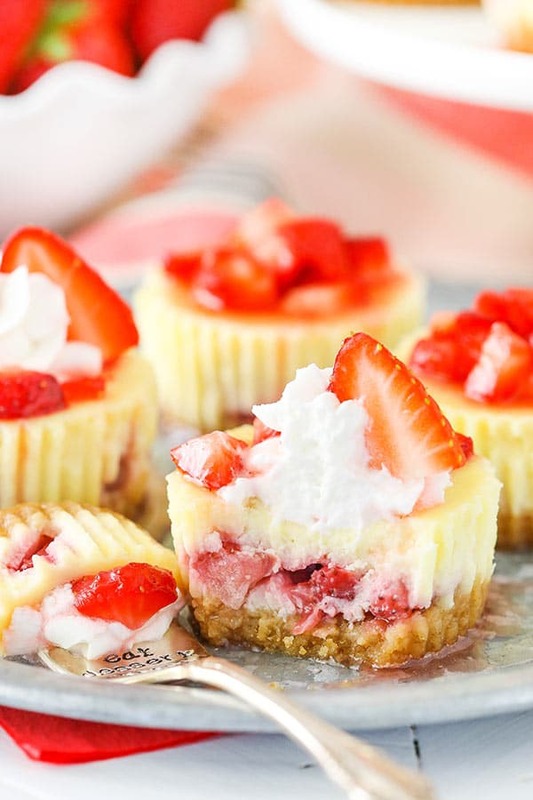 I used this recipe to create strawberry cheesecake crunch cupcakes and they were a huge hit! I omitted the extract and used strawberry instant jello pudding in its place! I am excited to try this cake tomorrow. (It’s sitting in my fridge as we speak) I have your book and every time I find a recipe online I want to try, 9 times out of 10 they lead me back here. 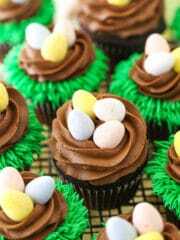 I love that these are relatively easy but make you look like a master baker! Unfortunately, since they are always so delicious, I now have to make everyone’s birthday cake! Sounds like a great problem to have! 🙂 I’m so glad you’ve enjoyed the recipes! I made the cake and there is a bitter after taste. not sure why. I follow exactly the recipe and process. When I made this cake the frosting would not stiffen up, it was like soup. Next time I would beat the cream cheese and powered sugar and vanilla then add the whipping cream, I had to run out and buy canned frosting to finish the cake, it was still a hit and tasted great. WOW – I made this cake, step by step, for my mother’s birthday this weekend. Changed the design on the outside a bit but EVERYONE and I mean EVERYONE (some of them don’t even like cake), said it was the best cake they had ever eaten in a longtime. I dressed the cake with strawberries, I cut them to look like roses and placed them around the top of the cake and in the centre, then I took green fondant (this is the only change I would make because it started weeping) and cut stems and leaves and had the stems running down the side of the cake from the strawberry rose on top, then randomly added the rose leaves. If I could add a pic now I would, just to show you. So glad you enjoyed it! Thanks Helen! Loved the cake!! I made it for my daughters 5th birthday, it was a huge hit! It was purple on the cake layers, and the frosting turquoise. So cute! And soooo delicious thanks for the recipe! This is one of the best cakes I have ever made or eaten!!!! Followed the recipe exactly as written and it turned out beautiful and delicious. I’ve got a strange time frame to try and do this in so I need advice. It’s for a very special birthday party and I’m running out of time. Is it possible to use a Jell-O No Bake Cheesecake for the middle? If so what would be the best way to do it? I wouldn’t recommend it. I’m not really familiar with the consistency of the Jello cheesecake, but my guess is that it won’t be firm enough to hold the weight of the cake above it. You could certainly use it that way, but it is a frosting that should be refrigerated. If the cake will sit out for more than a few hours, you might want to consider a different frosting just to be sure it holds up. This cake was SUCH a huge hit at my sister in law’s birthday that I’ve been asked to make it again. 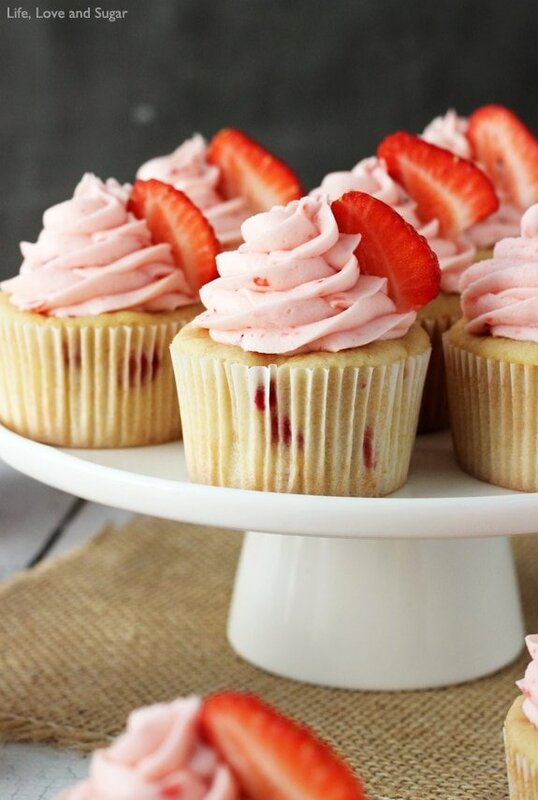 Rather than making the same cake again (not that it wasn’t simply amazing) I wanted to try the strawberry cake as cupcakes and use a strawberry cream cheese frosting. 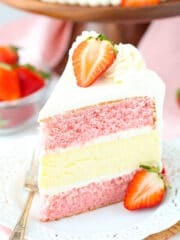 Do you think this exact recipe for the strawberry cake layers would work as jumbo cupcakes? You are my most frequented site when it comes to amazing sweets! Your recipes made me find my passion, making others smile through something I can make with my hands. Thank you! I just saw your recipe for strawberry cupcakes, being almost exactly the same. I figure maybe just double the recipe to make extra batter for the jumbo cupcakes and then cook them longer? I’m glad to hear you enjoy the site and recipes – thank you! Hi Lindsay, I am making this cake for a birthday of 25 people. How should I be adjusting the recipe? Thank you. I’m not sure. How many slices you get would depend on how big of pieces you cut. It’s a pretty tall and dense cake. But you might want a bigger cake and then I’m not sure of exact adjustments. Yes, it should be fine with gel color added. Can I use the cake batter and use it to make cupcakes instead? Help- my batter broke when I added the egg whites☹️ My ingredients were all at room temp. I also added the egg whites in two batches!! What happened. Can it be fixed? I am making this cake for mother’s day- I hope I can fix it. I’m not sure what you mean when you say it broke? Can I use cake flour instead of all purpose flour? If so, do I still need to use the salt and baking powder? I haven’t tried it with this particular recipe, but it should be ok. You would still use the salt and baking powder. Just made this cake for my husband’s birthday. He loved it! I used strawberry preserves instead of strawberry extract and strawberry purée and it still tasted great. Thanks for posting this recipe! I’m glad the substitution worked well and that you enjoyed it! Thanks Megan! 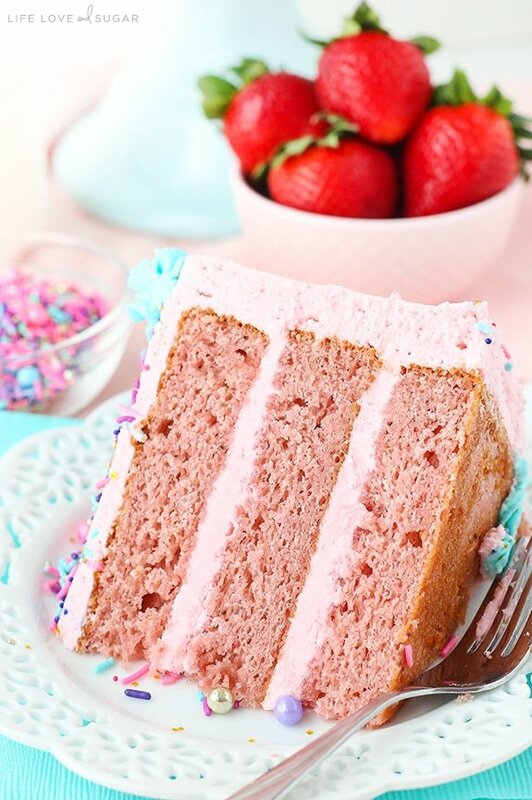 This cake is lovely and makes a bold and friendly pink statement. Spread the steps out (made the cheesecake last night and the strawberry cake today), and it fits in well around life! Mine isn’t as pretty looking, but it’s rich and summery at the same time. I served it for book club. Thanks for the recipe and clear instructions. It’s berry sweet. Hello! I have made this cake a few times (with a few variations), and I love it! The biggest issue I have is the icing! It ends up being so so soft that I can barely get it to stick to the cake. Can you please offer some advice? Could I be over mixing when I combine the whipped cream and cream cheese? Do I need to let it sit in the fridge for a while before I frost the cake? (I know I said with a few variations, but the icing part I do NOT change. I do it exactly as written.) Thank you so much!! Gosh, it’s so hard to say without being there to see what you’re doing. Over mixing is a possibility. You want to be sure that your heavy whipping cream is plenty cold – don’t let it sit out before making the whipped cream. I know you said you don’t change anything, but I have to ask – do you reduce the powdered sugar at all? It stabilizes the whipped cream, so you’ll want to use it all. As long as the whipped cream is cold and you add all the powdered sugar, you should start to get things thickening and then adding the cream cheese will just further thicken it. Also, are you using a hand mixer or stand? I do find that hand mixers don’t get whipped cream to be quite as thick – but it should still be thick enough for frosting the cake. I’ve honestly never done it to be able to say for sure, but if properly doweled for the weight, I’d think it’d be ok. I was wondering if it is okay to use the non-whipped cream cheese for the frosting? I used the whipped one last year and it worked great however I accidentally bought all regular/original today and are opened so I cannot exchange them anymore. I haven’t tried with this cake, but it should be fine! Regular cream cheese is fine – that’s what I use. I just started baking approximately 5 months ago so I am truly a novice. I made this cake for a get together. It turned out beautiful. I noticed when I was eating it ,every once in a while I would get an odd after taste (not enough to ruin the cake) my first thought was to much baking powder. I did read some posts that verified the correct amount of baking powder. Just not sure where to start trouble shooting this problem. I always make notes on my recipes for hints and improvements. I’m not sure, I haven’t really gotten than feedback before nor have I noticed it myself. But you could certainly try adjusting the recipe. I made this cake and followed directions to a T! My customers were in love with this cake! I used a buttercream cream cheese frosting instead because I didn’t want to have to worry about frosting getting warm and melting. Thank you so much for this recipe! Wished I could post a picture! The inside looks just like your image! I made it today for my Daughters birthday. I had my whole family over and the cake was so dense. I was so embarrassed when we cut into it and it was so tough. I noticed some comments that others had the same result. I cannot think of anything I did wrong. I did cream the sugar and butter very well. What else could be the cause of such a heavy dense cake? Overall the cake is fairly dense and heavy, particularly with the cheesecake in the middle. If you think the cake is much denser than it should have been, another possibly is over mixing the cake batter, which can over develop the gluten strand and give you a dense, tough cake. Made this cake over the weekend. I wanted to mention that the frosting was the best tasting, lightest frosting I have ever tasted. Thank you so much! My 23 year old son stated there should’ve been strawberry chunks in the cake but that the cake was entirely delicious. 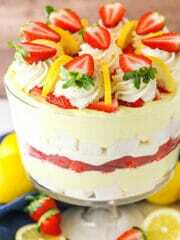 Perhaps next time, I will put slices of fresh strawberry between the layers. 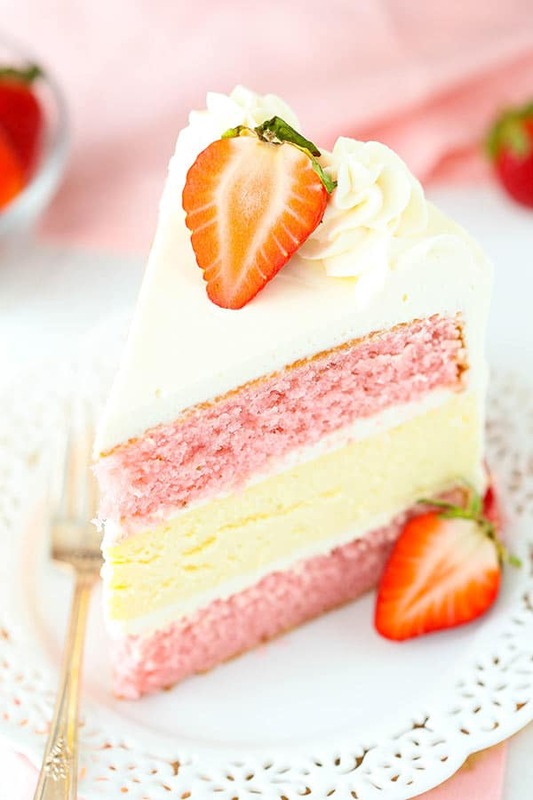 Hi Lindsay, I am about to make this cake but can’t find strawberry extract in Australia, would Strawberry Essence be an o.k substitute and would I use the same amount? I haven’t used strawberry essence, but my impression is that it’s a fine 1:1 swap.